As one of the most common industrial control systems, a Supervisory Control and Data Acquisition (SCADA) system is of critical importance to municipalities. By allowing for the centralized monitoring of the larger water system — wastewater treatment, storm water, water treatment, lift stations, etc. — SCADA systems streamline access and help ensure that everything is running as planned. Unfortunately, traditional SCADA systems haven’t kept pace with technology, leaving many municipalities with unnecessarily high expenses and a lack of flexibility, access, and security. From smartphones and photos to social networks and servers, the term “cloud” seems to be working its way into every conversation and corner of life, but what exactly does it mean to be in the cloud? It boils down to running software on someone else’s servers instead of your own “on premise” equipment. Those outside servers are owned by tech giants like Amazon, Google, Microsoft, etc. who offer up their infrastructure for rent for a fraction of what it would cost to do the same with on premise equipment. Not only does it cost less, but the cloud is more reliable as your software is now running on the same platform as Amazon and Google run theirs. Reliability on these cloud systems can go well beyond 99.9% uptime! IT costs are also drastically reduced as on premise equipment is eliminated and replaced with the cloud. Given all the benefits, companies far and wide are rushing to migrate to the cloud as a way to lower costs and improve efficiency. To be in the MetroCloud specifically means: eliminating upfront capital investments for on premise SCADA equipment and software, eliminating reoccurring IT costs related to on premise SCADA equipment and software, enhancing security, providing alarm notification and remote access, and improving reliability. To help ease the transition for the City of Ottawa, Metropolitan worked with the municipality to take a two-step, transitioned approach for the implementation of MetroCloud SCADA, our remotely hosted SCADA monitoring system. The first step was to rebuild the existing SCADA system communications and improve operator access to the system. By combining our 60 years of expertise with pump systems and our deep understanding of associated telemetry communications, we formulated a game plan to transition away from malfunctioning radio communication as well as revamping the SCADA system by bringing it the MetroCloud. We began by replacing the majority of old, barely functioning 900Mhz and 2.4Ghz spread spectrum radios with LTE cellular modems. The existing radios were switched over to cell modems without the need for reprogramming existing controls thus providing a quick, seamless communication transition. With the SCADA communications reconfigured, we were able to move to step two: transitioning a small number of municipal water components — three lift stations — to cloud hosting. The result? As planned, access was simplified, information was readily available with just a few screen taps or key strokes, and in less than a year the City of Ottawa took the plunge. 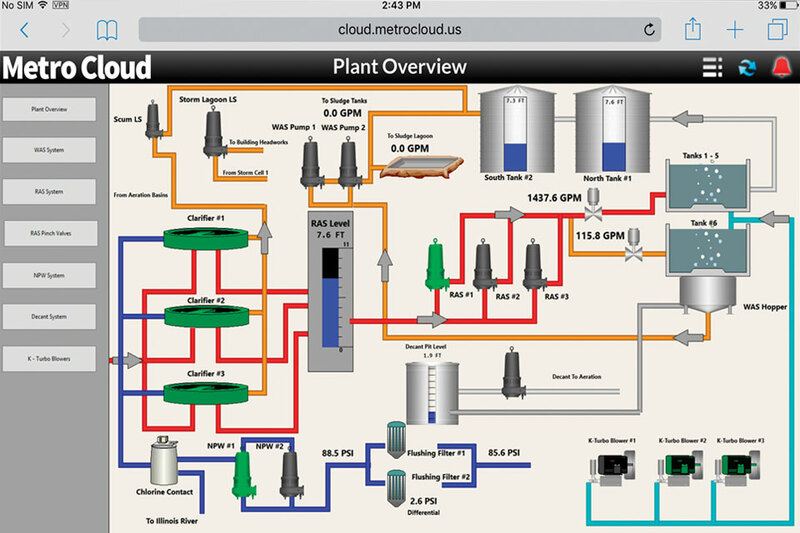 After recognizing the value of MetroCloud SCADA, they transitioned all eight lift stations, four wells, three pump stations, one water treatment plant, and one waste water treatment plant to the cloud and this new system has already proven its value. When the city was hit by a major tornado in February, communications via MetroCloud SCADA were sent as planned, allowing the city to remain aware of its water system despite the chaos and destruction that rocked the community. That’s all part of the security that’s inherent to every MetroCloud SCADA. When talking about the cloud, security concerns are usually one of the first things that come to mind. While it’s good to be aware of risks, MetroCloud SCADA puts security first by working to guarantee uptime and restrict access to information. To ensure reliability, all data using the MetroCloud platform is hosted on Amazon Cloud Servers, with 99.9% uptime and multiple servers in geographically redundant zones, meaning you’ve always got a backup should something go wrong. Additionally, we designed this system so user equipment is never exposed to the internet. MetroCloud also creates private connections into various cellular providers to use private IPs for cellular communications. Compared to public IP addresses, private IP addresses eliminate exposure of cell modems and the devices behind them to the Internet, essentially creating a gated community for your information – limiting access to only those that should have it. When connecting to MetroCloud via ethernet connection, VPN tunnels encrypt all data. All remote access into MetroCloud also utilizes VPN tunnels to guarantee data is protected from point A to point B. Remote access is available on virtually all platforms: Android, iOS, and Windows. SCADA systems can range from basic to complex. 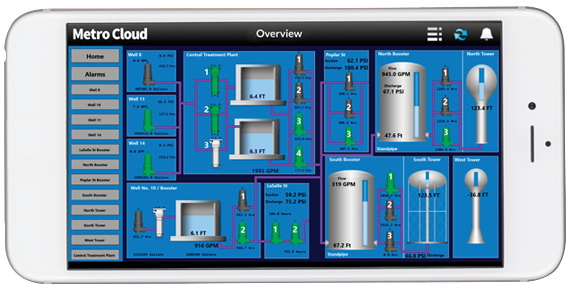 Thinking About Upgrading Your City Pump Monitoring to Remote SCADA? We’d love to discuss your existing city pump monitoring capabilities and the possibilities of what cloud SCADA controls can do for your.